A Russian Soyuz rocket blasts off from Baikonur Cosmodrome in Kazakhstan carrying the Progress 42 cargo ship on April 27, 2011. The Progress cargo ship will deliver supplies to the International Space Station. Before the shuttle Endeavour can receive final clearance for takeoff Friday afternoon, a Russian-made cargo freighter must make a smooth flight to the International Space Station. 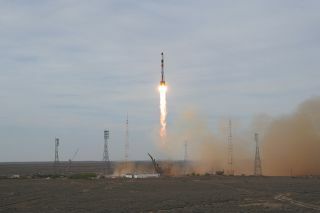 Step number one was accomplished Wednesday (April 27) when that unmanned resupply ship successfully launched atop a Soyuz booster from Kazakhstan at 9:05 a.m. EDT (1305 GMT). Shuttle Endeavour's original April 19 launch date was postponed by 10 days to deconflict with this vessel's arrival. Flight controllers opted against having the freighter rendezvous with the station while the shuttle was there, forcing Endeavour to wait on the ground until after the Progress was launched and docked. The 24-foot long ship will attach itself to the open port on the Pirs compartment, which was vacated last Friday when a previous Progress was jettisoned to burn up in the atmosphere. Today's liftoff was known in the station's assembly matrix as Progress mission 42P. The spacecraft's formal Russian designation is Progress M-10M. The refueling module carries 1,940 pounds of propellant for transfer into the Russian segment of the complex to feed the station's maneuvering thrusters. The vessel also has 926 pounds of water and 110 pounds of oxygen. The space station is staffed by the Expedition 27 crew of commander Dmitry Kondratyev, Cady Coleman, Paolo Nespoli, Ron Garan, Andrey Borisenko and Alexander Samokutyaev. The cosmonauts will be standing by Friday to take over manual control of the approaching Progress spacecraft if the autopilot experiences a problem. They spent time Tuesday reviewing procedures and conducting refresher training on the backup system just in case it is needed.